A BIG SHOUT OUT TO OUR COMMUNITY - THANK YOU! - Our 2018 collection is now finished and your donations have been delivered! We are simply in awe of our local community that came together and supported and donated to this collection drive for Dress for Success Sydney. We achieved our BIGGEST COLLECTION EVER! Keeley, our 2019 Rotary Youth Exchange Student is having a fabulous time in Switzerland. Check out her Blog about the adventures in her first month. Yay, they have arrived! The Revolution Chairs for the wonderful people at Inala have now been delivered. Fun and lots of luck to Keeley who is so fortunate to be heading to Switzerland as the 2019 Rotary Club of Beecroft's Exchange Student. Objective - Providing Dignity and Sanitation by building 250 Toilets in Mewat, India. Although Mewat is just 120km from New Delhi, this is the most backward part of the state and lags on all measures of development like, life expectancy, literacy, infant mortality, mother mortality and access to water and sanitation. Due to the generosity and support of our local community, businesses, volunteers and rotary members, the Rotary Club of Beecroft's local community projects for Taldumande Youth Services were very successful in 2018. SHARE A LITTLE, CHANGE A LOT! The Beecroft Rotary Tree of Joy is this year supporting Taldumande Youth Services kids. Our Rotary Tree of Joy is now up in Beecroft Place, Beecroft. Congratulations to our recipients of our 2019 Rotary Youth Exchange Program and Youth Leadership Awards. A very warm welcome to Madeleine to our Club, 4th generation! We have today completed the packing of the toiletry starter packs for the 500 homeless Sydney kids who each year enter the services of Taldumande Youth Services. 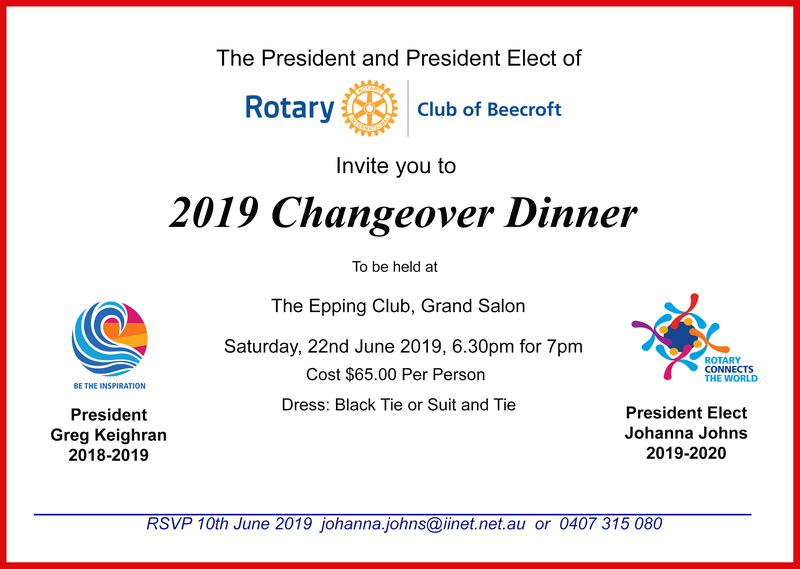 Rotary Beecroft are so very proud of this achievement which could not have been done without the great support of YOU, our local community, who in the end, DONATED OVER 9,500 TOILETRY ITEMS!!!!! Our wonderful volunteers who offered up their homes for our drop off addresses, and those precious volunteers that gave up hours/days/weeks to help sort and pack these 9,500 items into 500 toiletry packs and finally delivery them. To the Rotary Club of Crows Nest, North Sydney Sunrise Rotary Club and North Sydney Rotary Club who so generously helped us in collecting toiletries for this local community project, thank you. Cheers everyone and thank you. Let’s start putting these goodies away for our collection next year.